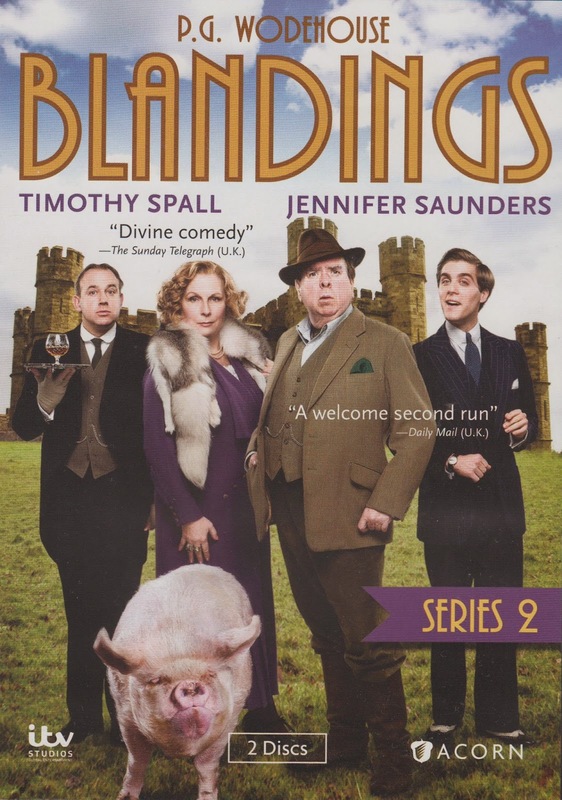 Clarence, the Earl of Elmsworth (played by Timothy Spall) and his wacky family (including resident pig, The Empress) are back with 7 all new adventures in Blandings: Series 2. No matter how hard Clarence tries to spend time with The Empress and his books on pig husbandry, his various family members and their problems keep interfering with his plans. Thank goodness he has the reliably placid butler Beach to help keep everyone in line. Episode one starts out on a distinctly jarring note with the arrival of some house guests -- the disagreeable Alaric, Duke of Dunstable and his niece Linda. The Duke is forever shouting at people, and, without much provocation, throwing eggs at them. He's especially upset that his niece wants to marry the totally unacceptable Pongo Twistleton. 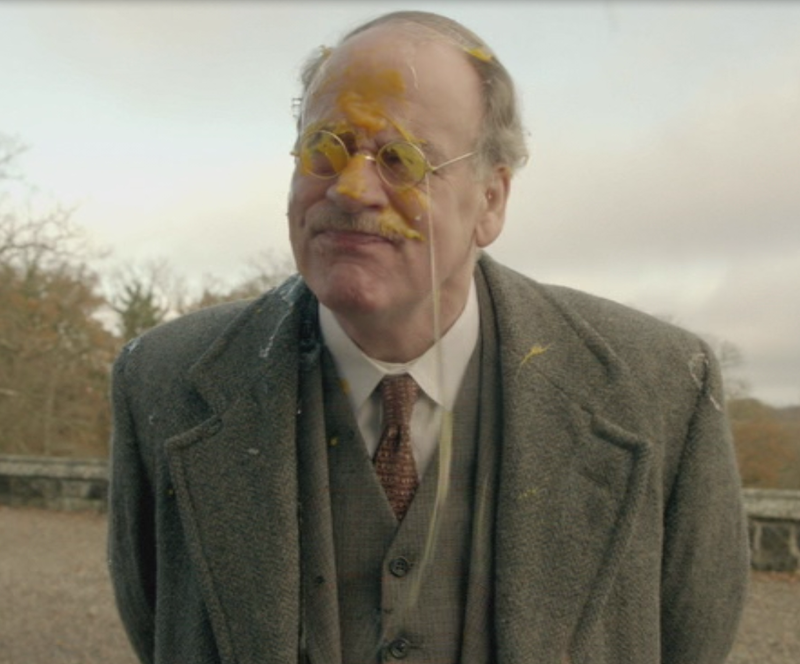 To make matters worse, Alaric is convinced that Clarence needs to be committed to an asylum, and calls for Dr. Glossop from London to come to Blandings to examine him. 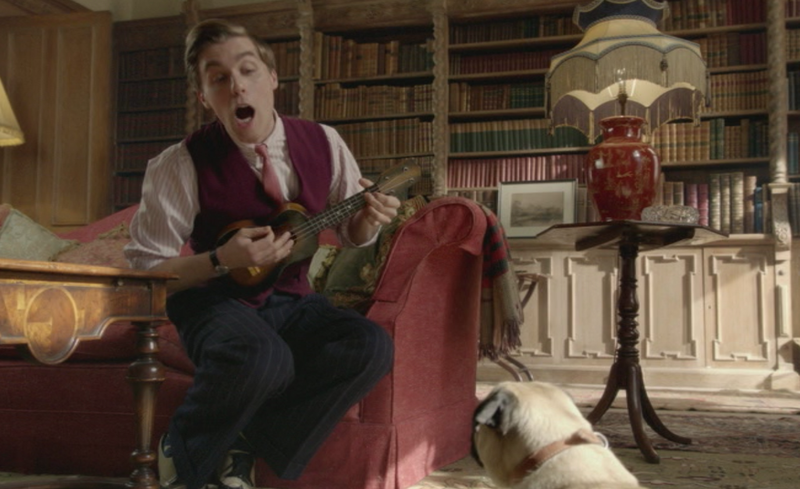 In the meantime, Freddie, Clarence's perpetually broke but cheerful son, gets wind of the scheme and decides to get Pongo to impersonate the doctor. Connie, Clarence's long suffering sister (played with delightful exasperation by Jennifer Saunders), wants the doctor to examine Alaric for possible committal. It's general mayhem, as usual, with the added bonus of eggs being tossed about by the generally enraged Alaric. Clarence has just breathed a sigh of relief at getting rid of the eccentric Alaric when more bad news arrives in the person of his other sister Charlotte and their niece Millicent. 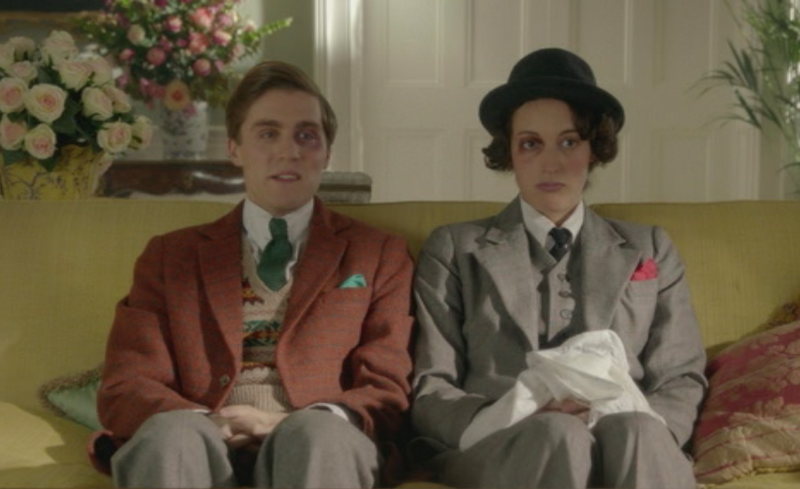 Charlotte is appalled at the lax standard of things at Blandings, and declares her intention to move in. Millicent takes a liking to Clarence's new secretary, Carmody, but Connie wants that relationship nipped in the bud. Poor Clarence doesn't have time to deal with distressing domestic matters, however, because the fat pig contest is coming up, and his chief rival, Stinker Parsloe is surely up to something to give his own inferior porker an unfair advantage over the vastly superior Empress. Freddie has a brilliant idea to make Carmody seem more acceptable to the family -- they will abduct the Empress, and Carmody will come to the rescue and find her. When Clarence discovers the Empress is missing, he assumes the dastardly Stinker is responsible, so he decides to exact his own revenge. While Stinker is innocent in the pig-napping plot, he is behind the scheme to give the Empress Slimmo pills before the big weigh-in . . .
Poor Clarence doesn't have time to relax after all the narrowly averted disasters of the previous episode when more chaos descends into the house. Brother Galahad arrives with a bombshell -- he's writing a tell-all memoir that will expose the secret escapades of all the upper crust people in their social circle. Connie, of course, is horrified and offers to settle all of Freddie's debts if he will find the dreaded manuscript and deliver it to her. Meanwhile, the fat pig contest is still on the horizon, so Stinker decides to hypnotize the Empress into dieting, but his plan backfires. Clarence finally decides to rebel a bit against Connie's iron rule when he defiantly grows an unruly beard. Naturally, he implements this rebellion at a time when Connie has invited the conservative and pious Lady Cloughly to stay at Blandings. To complicate matters, the heating has gone out in the castle, despite the best efforts of Beach to beat the old boiler, Brynhilde, into submission. When Freddie offers a movie crew the use of the castle as a location for their latest film, he has to tell his Aunt Connie that all the people and equipment are there to fix the heating. Starlet Pauline Petite has caught the eye of both Freddie and Beach. Not realizing that a film is being made, Lady Cloughly is alarmed to see what's going on in the parlor between a disguised Beach and the actress Pauline. The "tramp" who keeps wandering around the castle is also a bit odd . . .
Julia's pug Mugsy. Valerie takes such a shine to Mugsy that she takes him with her when she leaves. Clarence, alarmed at the prospect of his sister Julia's reaction if she discovers the dog is missing, goes to Col. Fanshawe's home to steal the dog back. Unfortunately, Beach the butler has discovered some "Swedish vitamins" that don't seem to be having the desired healthful effects, so he's unable to assist with the plot to steal back the dog. Episode six once again sees poor Clarence with a houseful of bothersome guests. There's the American heiress Vanessa Polk, who has been hired to paint a portrait of Clarence and the Empress. Lord Hannibal Didicot is enraged that Clarence sold him a worthless painting, and he demands his money back. Brother Galahad is also visiting and assisting Freddie in his plots to somehow find the money to settle his most recent debts. Freddie has a worthless painting of a horse the he hopes to sell to Lord Didicot, but he angrily refuses to buy it. That is until he hears Vanessa talking about an extremely valuable painting, and thinks she's referring to the horse painting. Connie is also hoping to do some match-making between Vanessa and Lord Didicot, which allows Freddie and Galahad to put a blackmail scheme into motion. The final episode finds Connie finally putting her foot down: her flighty nephew Freddie must get married. Luckily, she has a suitable candidate in mind -- Felicity Parsloe-Parsloe, Stinker Parslow's niece. Freddie, who up until this point had met few females he wasn't attracted to, is rather alarmed by Felicity. She's taken to dressing like a man and only speaks in monosyllables. Aside from her rather unconventional looks and manner, there's the added complication that Freddie has fallen madly in love with someone else: Niagara Donaldson, the niece of McAllister, Clarence's groundskeeper. McAllister knows Freddie's history, and so resigns his position in protest. The big pumpkin contest is coming up, and Stinker Parsloe immediately hires McAllister to spite Clarence. Connie was complete opposed to Freddie's romance with Niagara, until Beach the butler reads in a society magazine that she is heiress to a biscuit fortune. Now if Clarence can just woo McAllister back. 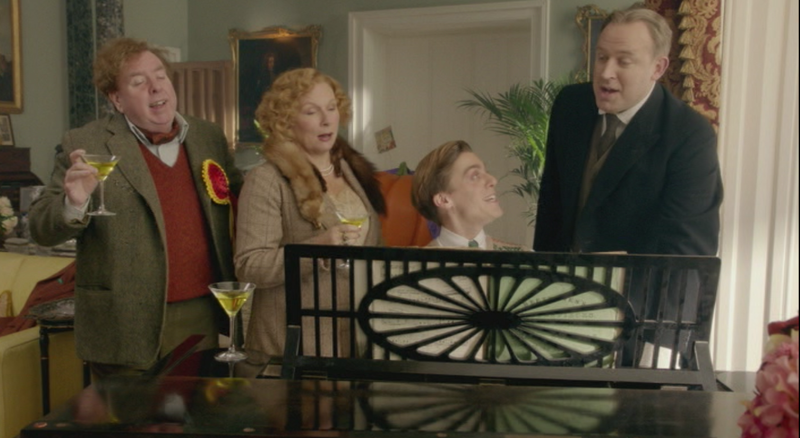 The slapstick situations and witty dialogue make The Blandings a totally enjoyable series. The actors are all first-rate, and it's also fun to see familiar faces (Celia Imrie, Robert Bathurst, Harry Enfield) make appearances. 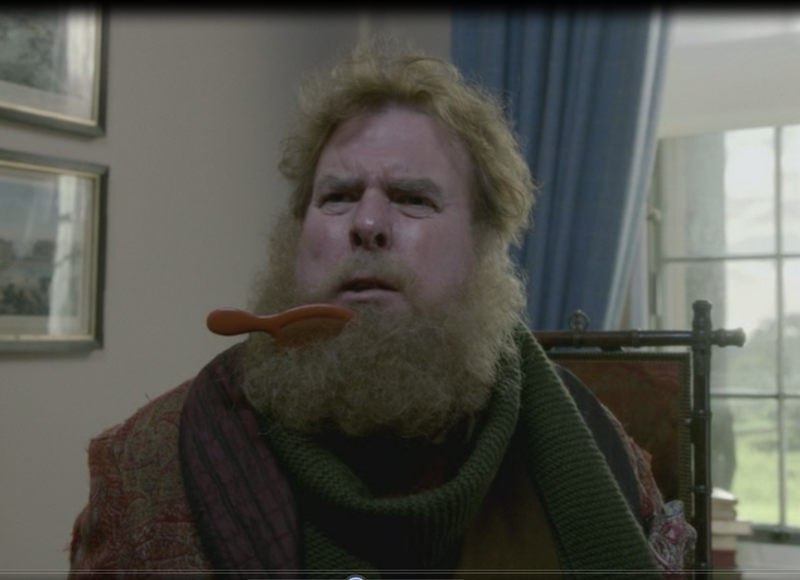 I hope this series will continue for more adventures in the beautiful, if chaotic, Blandings castle. Disclaimer: I received a copy of Blandings: Series 2 from Acorn Media in exchange for this review.